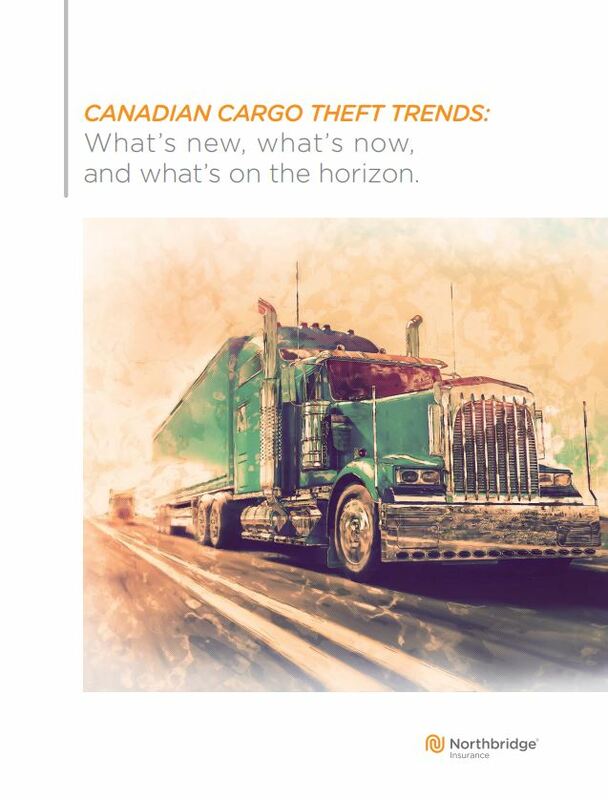 In our previous article, we outlined some of the most important trends in Canadian cargo theft to monitor today. Here, Garry Robertson, Manager of the Northbridge Claims Special Investigations Unit and resident cargo theft expert, digs into what this could mean for Canadian trucking companies, drivers, and citizens across the country. What forms of cargo theft are we seeing these days? Thieves operate in a variety of ways. Organized groups can target specific types of merchandise or individuals could “yard shop”, trying to find products they can flip quickly at a big profit. In other cases, load brokers advertise that they’re looking for certain types of products, leading professional thieves to seek out those products and intercept the scheduled shipment. What are the concerns surrounding cargo theft? Aside from the staggering amount of revenue that’s on the line, Canadians have plenty to be concerned about. For one, cargo theft supports a black-market economy: a major cargo heist can be worth hundreds of thousands of dollars, money that can be used to support the drug trade, the gun trade, and even terrorist fundraising. So, in the end, public safety could be intimately tied to what’s happening with transported goods. What sort of cargo is at the highest risk of theft? Cargo that’s not moving is always more vulnerable – especially when it’s kept in an unsecured yard. There are certain times of year that require extra diligence, too. For instance, long weekends are prime time for cargo theft, because thieves have another full day to transport and unload their treasure; the crime can be carried out on the Friday and go unnoticed until work starts back up on the Tuesday. A good way to keep cargo safer is to keep it moving and get it to its destination quickly, without stalling too much between point A and point B. Of course, certain types of cargo are more tantalizing than others, with food and beverage loads and mixed loads usually topping the list. Why is mixed load cargo so appealing to thieves? There are some distinct advantages to swiping loads that combine a variety of generic goods. The first is that there are no distinguishing marks to look for, and no serial numbers or tracking characteristics mean these sorts of everyday goods are tough to trace. Consider a product like laundry detergent: the load can be split up quickly, sold almost anywhere, and will often blend in seamlessly with the rest of a store’s inventory. You might imagine that these stolen goods are immediately whisked away to remote areas. That’s not always the case. In many instances, the products wind up in local flea markets and inconspicuous neighbourhood shops, where they can be sold immediately (and the thieves can swiftly reduce their risk of exposure). Where in Canada is the biggest uptick in cargo theft taking place? It’s a bit more complicated than simply pinpointing the area with the highest theft numbers. A major problem has been the lack of reporting across the country, aside from in southern Ontario. In turn, it looks like Ontario is way above other regions in terms of cargo theft, but there’s more going on underneath the surface – and that demands some attention. Right now, our focus is on Alberta: while Ontario and Quebec have historically been hot spots for reported cargo theft, more consistent reporting is coming out of the west. We’re seeing more lumber loads and heavy equipment going missing, and now Alberta is catching up to Quebec in terms of reported thefts. What is the most surprising (or worrying) cargo theft trend you’re seeing right now? Simply put, cargo theft is escalating. It’s a problem that’s been around for a long time, but criminal circles are becoming more sophisticated in their organization and approach to trucking crime. For example, cargo isn’t the only target these days: some thieves are now stealing the trailer as well, melting it down, and selling the scrap metal. So, carriers and owner-operators are at risk of losing both their cargo and their mode of transport. Why do you think meat theft is on the rise in Southern Ontario and Quebec? It may seem like a strange target, but a load of meat or poultry can bring in a lot of money, especially during barbecue season! And this isn’t a product that attracts small-time thieves; in order to pull off this sort of heist and reap the rewards, cargo criminals rely on an advanced logistical framework that requires coordination and investment. Criminals are enticed by the fact that meat can be unloaded quickly, but it also needs to be. Spoiled meat is worthless, so refrigerated trucks are needed to transport the stolen load, and networks of people must be ready to sell and deliver the product to customers immediately. All of this takes time, money, and practice. What does the rise in cargo theft in and around Toronto tell you about the developments in how thieves are operating? Mississauga, Brampton, and Toronto are some of the largest trucking hubs in North America, so they’re bound to attract some criminal activity. Infrastructure likely also plays a role in the rising number of reports within the region: with the 401, the 400, and the QEW highways winding through the area, there are multiple avenues to neighboring cities where loads can be dismantled and sold off. Mixed load cargo theft in the Toronto core is also up, and we suspect it’s due to the concentration of Less-than-Truckload (or LTL) centres in the city. These holding centers, where cargo loads can sit for quite a while before they’re split up for local delivery, are tempting to thieves. And while most LTL centres are secured, there are some that are unsecured – obviously, these are the ones that are most vulnerable. What can carriers do to protect themselves from the theft that’s taking place through online broker systems? In many cases, theft comes down to a weak link in the system. Load broker systems are typically independently owned, which means cyber security rests entirely on each company, so we need to appeal to the individual companies to devote time and attention to keep their sites safe and secure. More than ever before, names of transportation companies are being used to steal cargo loads. Thieves visit online load broker sites and target specific loads that are scheduled to be picked up, then they create false documents and pick up the load early using the stolen identity. No wrongdoing is suspected until someone from the victimized company goes to retrieve the load, only to find out it has already been picked up. Identity theft is a big problem, but it’s not the only problem. Just like with personal computers, weak passwords are often to blame for cyber attacks. Load brokers need to get serious about keeping passwords private, restricting access among employees, and updating stale passwords to keep their defenses strong.